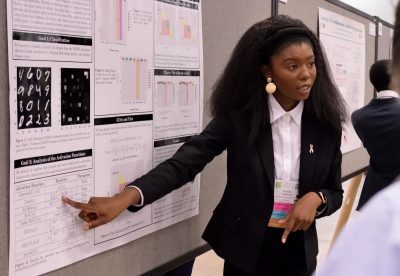 When Heyley Gatewood, a junior double major in computer science and mathematics, would try to interest students in Stetson’s annual spring “hackathon,” she noticed the uneasiness in those without a computer/tech background. A new series of computer tech workshops organized and presented by Stetson Hackerspace, the university’s official computer science club, hopes to change that scenario. The four workshops, which begin Nov. 10 and run through Feb. 23, are designed for Stetson and area high school students with absolutely no computer experience. “When we started our hackathon, we mostly just attracted collegiate hackers who are already into computer science and are already experienced,” Gatewood said. Students from all majors and backgrounds are welcome to attend the workshops. Stetson Hackerspace also hopes to recruit students from area high schools. The workshops will be held in the computer labs (rooms 317 and 322) at the Lynn Business Center, corner of Woodland Boulevard and Michigan Avenue. 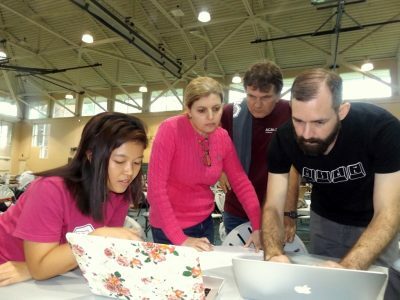 From left, Stetson computer science major Erica Kok looks on as Stetson computer science professors Hala El Aarag, Daniel Plante and Joshua Eckroth judge the app-creating competition at the Greater Central Florida Tech Faire + Hackathon in April 2018. Students can pre-register for any of the free workshops by emailing hack@stetson.edu. Students can register at the Lynn Business Center on the day of the workshops, but only if spaces are still available. No-Code App Build Workshop – 2-4 p.m. Saturday, Nov. 10. Participants will build and deploy an app that can be used to organize campus and extracurricular events, such as fundraisers. Users of the app will be able to post events, see a list of events, and register for and rate events. Participants will be able to customize their app and continue building it after the workshop is completed. Local Hack Day and Hour of Code – 9 a.m.-9 p.m. Dec. 1. This event is a combination of Major League Hacking’s Local Hack Day and Code.org’s Hour of Code. Students will have the opportunity to learn a different computer science programming language or topic every hour for 12 hours straight. Build and Deploy First Website – 2-4 p.m. Jan. 26. Participants will learn the structure and syntax of basic HTML and CSS. They also will receive a skeleton of a portfolio website and will update the HTML to include information about themselves and edit the CSS to style and position elements on their page. Then they will deploy their new website. Hacking Alexa – 2-4 p.m. Feb. 23. Participants will learn the basics of how to build skills for Amazon Alexa to run on Alexa devices like the Amazon Tap or Echo. Dates for the Greater Central Florida Tech Faire + HatterHacks will be announced soon for the spring, as well as the site and other details.